This a view looking up Fern Lane taken from the main bedroom French windows. The Baker's Alley courtyard entrance is shown at the bottom of the picture. The lane is a cul-de-sac off the main Thame road and provides a nice quiet retreat that is still in the centre of the village. 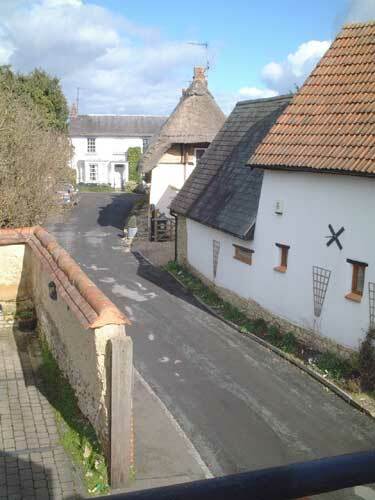 The lane becomes a cobbled foot path at the far end which provides you with a pleasant walk through to Townsend Green. The blue door is the entrance to Wychert cottage. You can see the semicircular turret that provides the dinner area. 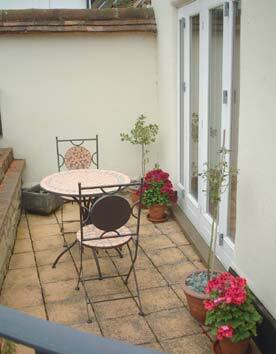 The private patio area is shown on the photograph below. It is just outside the lounge French windows. In the warmer months a bistro table and chairs are set up on the patio.